Shelley Waddington of EnVoyage Perfumes is also known as “the Carmel Perfumer”, since her native Carmel-by-the-sea in Northern California is the most important influence in her work. 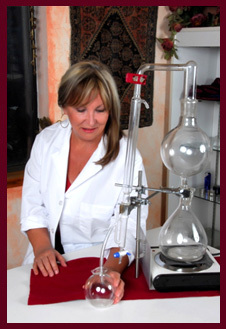 Shelley has a diploma from Galimard Perfumeur in Grasse, France. Her perfumes are mainly inspired by her travels, but also by legends and lore, and by the beauty of her hometown of Carmel-by-the-Sea, with its storybook English cottages, dramatic scenery, and amazing flora. I was lucky enough to stay in Carmel once (now almost twenty years ago, where did the time go???) and I am still impressed with the natural beauty of the area and I dream of going back there again. Living in such a place must be inspiring indeed, which is why I am interested in Shelley’s work. Today we hear more about Shelley, the person, though. Hopefully in the near future I will be able to write about the work. A good day starts with… a cup of French roast and a morning walk on the beach. I’d never leave the house without… my car keys. My life is totally pared-down. I always feel good when… my state of mind is curious and interested and learning about something or someone. My favorite thing in the world is… being with the people and animals that I love. The next thing I want to buy is… a navy blue Jawbone Up, a picnic blanket, and some Diorskin Airflash for my son and daughter-in-law. The place I always come back to is… the Carmel beach. My Xanadu, my source of inspiration and energy. My personal style… ranges from California-casual to understatedly elegant. My favorite perfume… ranges from simple oils to true perfumes made by myself or others. This week I’ve worn green lemon oil, Emeraude by Coty and my own creation, Zelda. When I travel… I am minimalist – I like to be portable and ready for adventure. To relax I need… only a quiet moment to regenerate. But I seldom turn down a massage. I like to gift people with… loyalty, appreciation, and unexpected surprises. When I have a bad day… I try to remind myself that I’m more than my ego, and to remember to forgive myself and others. And it’s always a boost to recall an accomplishment, a special moment, or something I did for someone that they may not have even known about. I find my inspiration from… travel, art, music, nature, learning, reading, interesting people, and from dreams and memories. Sources for inspiration are everywhere; to become inspired is a function of being in the moment and paying attention. Something I would never want to miss is… to be living near my son when he starts his family. My last mistake was… migrating to Windows 8 during a very busy business cycle. In my fridge there is always… Greek yogurt, blueberries, soy milk, Trader Joe’s salads, yummy cheeses, egg whites, fresh veggies, salsa, Greek and Italian olives. On my nightstand I keep… the books I’m reading, a pen and notebook, and a sample of new perfume to sniff while I read. The perfect weekend starts with… waking up early and having a good cup of coffee at my garden table with my sweetheart. My role model is… Eugene Delacroix for his courage and determination to challenge the status quo. Something I always want to be asked in questionnaires like this is… about the focus my creative vision. My vision and intention is to create a legacy of unforgettable top-shelf perfumes at an affordable price-point for the public. I remain a small independent artisan because this is the only way to retain my ability to make my own informed judgments about fragrance materials rather than to be restricted by outside regulatory agencies, and because I am not beholden to any commercial corporation that places price restrictions on my development of a formula. I sell my fragrances at wholesale prices to keep the price point affordable to perfume-lovers who understand and appreciate what I’m doing. I sell only online at my own web store. The path to commercial venues remains an open option, but the prices would be much higher and it would require compromising the formulas and ingredients. The legacy nature of the perfumes would be completely lost. Aside from the landscape, Carmel has one more attraction in Shelley, in my opinion. I admire her minimalism and pared down style. Not being dependent on lots of material things is a skill I’d like to develop better. Are you familiar with Shelley’s fragrances? What is your favorite? This entry was posted in Interview and tagged California, Carmel, En Voyage Perfumes, Fragrance, Grasse, Interview, Northern California, Perfume, Shelley Waddington. Bookmark the permalink. In the fridge… egg whites… – and where are the yolks going ? In the Uk you can buy it (them?) in cartons, like milk… still no idea where the yolks go, maybe to cake manufacturers? I’m very curious about Zelda too! Enjoy your new bottle! Another Zelda fan here – Natalie introduced me to it and I was wearing my sample earlier this week and thinking I need more of this! Will check out her site…I have been to Carmel a couple of times, though one occasion was well BP (‘before perfume’) and the other one was before I learnt about Shelley’s range. I didn’t spot Clint Eastwood either and Ajne had closed early and gone down the pub. Carmel is really a lovely spot, isn’t it? Unfortunately I haven’t tried any of perfumes from EnVoyage but I’ve also heard good things about Zelda. How nice you’ve been to Carmel, B. That must help you to feel connected to Shelley’s fargrances considering the local environment is such an inspiration for her work. I’d recently heard of that Up health monitoring system but didn’t know what it was called. It’s a great idea and sure it will help manybut I think it would only stress me out. She sounds so lovely! I wish I could be more like that, in the meantime I will try to seek out the perfumes. Thank you for the interview, Birgit. I *LOVE* Shelley’s perfumes Zelda and Vents Ardents! I think you would really like Zelda, as well. I’d never heard of Jawbone Up before either, so had to check it out. That’s quite an bit of technology, isn’t it? I loved your reviews of the perfumes, they sounds certainly lovely. Let me know how you get on with the line, Valerie! 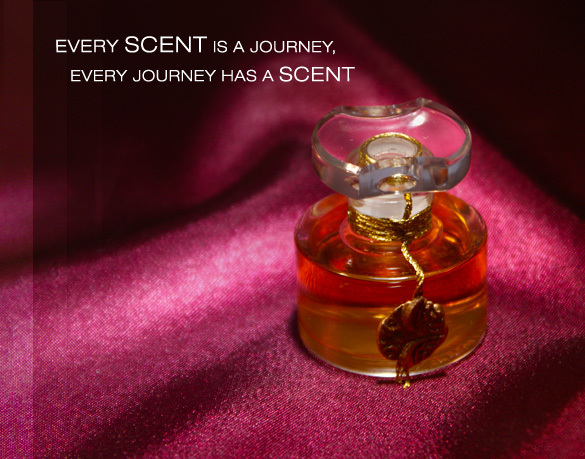 I am not familiar with Shelly’s perfumes but now I want to explore them thanks to you and her lovely interview. Carmel is indeed one of the most beautiful spots in California (Parts of “National Velvet” was filmed just north of the town and you can see it in the distance.) The town is only an hour and a half away from me. I love to go there for long weekends and just unwind. And big bonus, glorious Big Sur is right there too. The Central Coast is indeed a bit of heaven on Earth. Lanier, it must be lovely to live so close to this beautiful area (well, San Francisco itself is beautiful enough!). I’m glad you feel inspired to explore Shelley’s perfumes now.